spiderwebwoman … » Add USB to your wall outlets – No Hacking Needed! 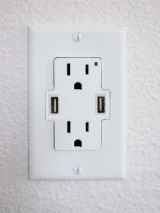 Add USB to your wall outlets – No Hacking Needed! Now this is cool. The TruePower UCS power outlet is available for pre-order from FastMac for $10 a pop, the outlet is not only easier than building your own, but it’s as cheap or even cheaper and doesn’t displace the AC outlets. Just swap the outlet and you’ve got two USB power ports alongside the usual two AC. The USB ports only draw power when a device is connected. Comments Off on Add USB to your wall outlets – No Hacking Needed!